“One of Herzog’s smartest directing choices was casting Klaus Kinski in the role of Dracula, which was a part previously played by Max Schreck. Klaus Kinski makes a formidable vampire and his dynamic working relationship with the director undoubtedly impacted his performance. 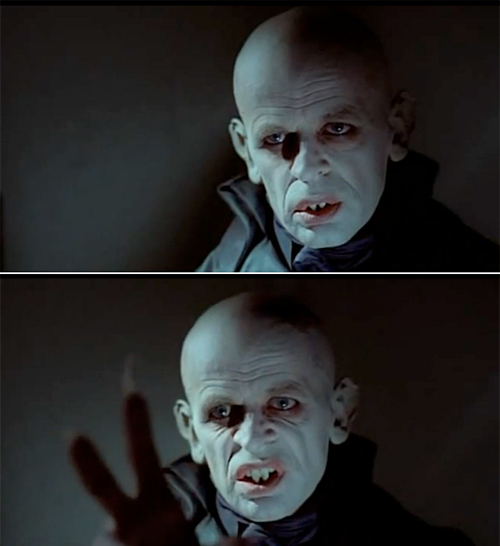 Strangely enough, the role of Dracula in NOSFERATU also provided Kinski with one of his most sympathetic and humane roles. Although Kinski is obviously playing a hideous undead creature, he manages to give Dracula some genuine humanity and it’s one of the actor’s most fascinating and strangely touching performances. Instead of directly following in Max Schreck’s footsteps, Kinski seems to have been inspired by the tragic monsters found in classic Universal horror films such as FRANKENSTEIN (1931) and THE WOLF MAN (1941). In Klaus Kinski’s autobiography he articulated how much the physical aspect of playing a vampire had transformed him. In Holland and Czechoslovakia and all the way to the Tatra Mountains on the Czech-Polish border. The departure point is Munich. Four weeks before shooting starts, I have to fly there for costuming. And this is where I shave my skull for the first time. I feel exposed, vulnerable, defenseless. Not just physically (my bare head becomes as hypersensitive as an open wound) but chiefly in my emotions and my nerves. I feel as if I have no scalp, as if my protective envelope has been removed and my soul can’t live without it. As if my soul has been flayed. Want to read more? Please visit The Movie Molocks!